Frankenstein is the name of the doctor, not the monster. These are all indisputable facts. Unfortunately, we are currently living in some bizarro, post-truth world where certain people try to dispute and argue about facts like the one's listed above. And if there is any term more misconstrued and misunderstood currently, it would be "fake news". But what exactly is "fake news"? We live in a 24-hour news cycle, bombarded by information overload. In our modern media age, there are many voices, all speeding down and colliding with each other on the information superhighway. At its best, a platform like social media is a way to communicate news and information quickly and effectively with one another, creating communities to exchange and share ideas for the common good. At its worst, it's a never-ending game of Whisper Down the Lane, twisting facts, amplifying inaccuracies, and creating distractions and divisions among us. Journalism has been coming under attack and the very essence of Freedom of the Press is being questioned by our own government officials. How does anyone make sense of it all? 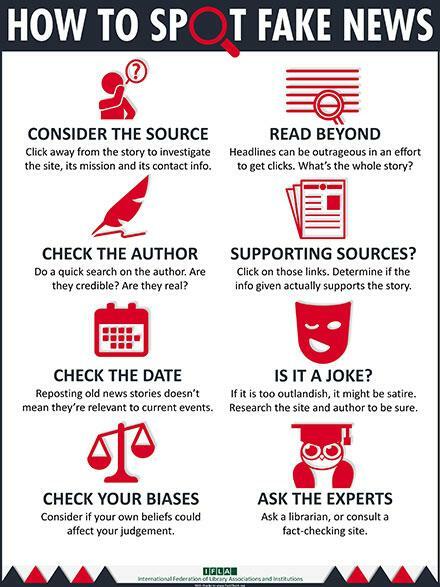 The International Federation of Library Associations and Institutions (IFLA) recently came up with a great infographic on How To Spot Fake News (based on resources from the nonpartisan, nonprofit organization FactCheck.org). We encourage you to read it, download it, print it out, and even pass the info on to your friends and family members. Did you find the source via a link on social media? Have you ever heard of the website where the story is featured? Is it a reputable news source or just someone's personal blog? Is it a satirical website like Cracked or The Onion? Look for the website's About section and read more background information about the website to make an informed decision. Again, if you found the story via a social media link, did you just read the title of the article or did you actually read the entire story? If the article title feels like clickbait or too good to be true, it usually is. It has unfortunately been shown that many people only read the titles of articles online. Always read the whole story! How many other stories has this author written for the website you are viewing? Again, is this a reputable news source or just someone's opinion on a blog or social media account? Feel free to look the author's name up on Google to find out more information about them. If a percentage or statistic is given in a story you are reading, look up the organization that allegedly supplied the data. Do they actually exist? Websites like Snopes.com are a great resource to research possibly bogus claims. A perfect example of this is when someone famous or infamous passes away, you'll see a flood of posts on social media... but the person(s) in question may have died years ago! 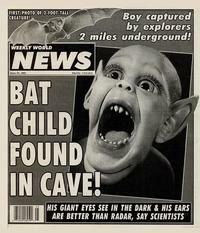 Same goes for news stories: always check the date. 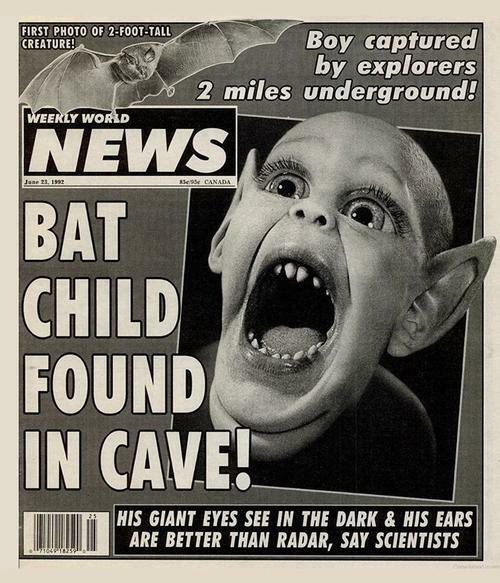 Just because a news story has an older date on it doesn't mean the info is necessarily outdated or incorrect, it just depends on what is being discussed. A great resource for this is the Internet Archive's Wayback Machine, where you can view cached and archived websites, seeing if info has changed or stories have been updated. As always, read carefully and use critical thinking. Hoaxes. Pranks. Spoofs. The Internet is full of misinformation! If the story seems too outlandish, too good to be true, or seems silly, jokey, or just plain weird, then it is more than likely coming from a satirical site poking fun at something or someone. Take a minute and check the author's name, check the website's About section, and always read the fine print. This is a huge one and probably the hardest to be honest about, no matter what your beliefs. Confirmation bias leads people to put more stock in information that confirms their beliefs and discount information that doesn’t. This is, again, a big issue on social media, where people surround themselves with like-minded friends and interests, and their news feed may be in danger of becoming one big echo chamber. Never feel afraid to ask questions, especially here at the Free Library! It is our job to help educate and inform patrons when they ask questions. You can visit a neighborhood library location and talk to a librarian, use these trusted news resources on our website, or send us an email or chat online. Some additional library resources for spotting fake news and deciphering fact from fiction can be found via websites like Programming Librarian, who has a number of great seminars available for viewing. For an even deeper dive, read through The Pew Research Center's State of the News Media portal, a comprehensive collection of facts, data, and research on our ever-changing media landscape. In summary, these are by no means an exhaustive list of resources, but mainly a quick start guide to help individuals start thinking more critically about the news, our world, and the human condition. 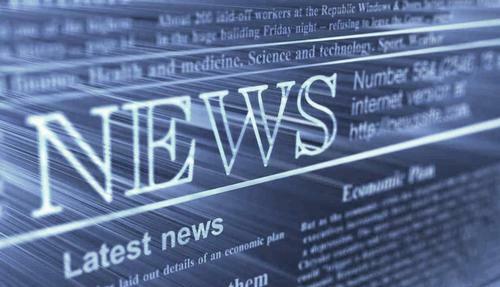 We live in a 24-hour news cycle, bombarded by information overload. How does anyone make sense of it all? If the story seems too outlandish, too good to be true, or seems silly, jokey, or just plain weird, then it is more than likely coming from a satirical source.